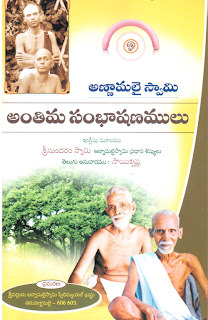 The devotees of Annamalai Swami have recently brought out a Telugu edition of Annamalai Swami: Final Talks. Unfortunately, the Ramanasramam management has decided that it does not want to stock this book in the Ramanasramam Book Depot. Telugu-knowing devotees who would like to purchase a copy of this new book should contact Sundaram, Annamalai Swami's former manager, attendant and interpreter. His email address is gurudeva000@gmail.com. Sundaram also has Tamil copies of Annamalai Swami's Final Talks and his Diary. It is quite simple;the asramam is visited by devotees and it will be easier for them to buy the book if the asram decides to put it in their book shop display stands. Secondly,Sri Sundaram is doing his bit with slender resources and unless the sales pickup,he may find it difficult to rotate the funds for the next project. Sundaram has also brought out audio CD of AnnAmalai Swamigal's conversation with my cousin Siva;This was recorded on an old two-in-0ne cassette player/radio and the quality is so,so.Yet,it gives an opportunity for devotees to listen to AnnAmali Swami in his elements,quite simple,casual and humorous,as if in a conversation between friends. Sundaram found the conversation so interesting ,that he recorded it without either the swami or siva having any wind of it;it was only when the cassette ran and reached to the end,there was the click as it was ejected.Hearing the 'Click' siva looked at askance and Sri Sundaram then told him that he found the conversation quite interesting and decided to Record it. I will narrate a humorous story that swami Narrates in this conversation a little later. Those interested may get in touch with Sri Sundaram for the CD as well.The Talk is in Tamizh;Swami was pretty conversant with the teaching of Sri Ramakrishna as well. Trust this answers your curiosity. Nothing philosophical about this statement,unless you have read one into it,in which case the onus is on you to find the answer. Sri Sundaram has brought out a CD wit AnnAmalai SwAmi chanting excerpts from Ribhu Gita(about 38 minutes).The next track is the conversation with Swami,Sundaram and siva.The quality of recodring is below par but is still quite serviceable. Siva asks swami:'We have to live this worldly life and are caught up in it;If only we can spend the whole of our time in sadhana'! Swami answers him saying that it has to happen;it cannot be done,Just like a ripe fruit falls to the Ground.All the activities should go on and one cannot stop them.Only one should bear in mind one's identity that one's truth is the Atma. Appropos of how one should live in the world,Swami advises the maxim that outwardly one should act as if one belongs to the world;he then narrates this story. In MalayAlam(kerala),some drunkards get drunk and walk the Road;if they see a teetotaller,they would get angry and may pick a fight with him;so the commoner also has to pretend that he is 'more drunk' and not just that,he would proactively go and approach the 'real drunken' one and give him a Nudge;This would make him happy and reassured -'Oh!he is our man,afterall,much more drunk that us'.This way one can escape the wrath of the Drunken man." "The next track is the conversation with Swami,Sundaram and siva." Ravi: Is the coversation in Tamil? If it is not too much of asking, is it possible for you to post the conversation here in English? Ravi, you must ask yourself if you have understood WHY cos the post was made by David and you acted the spokesman. Ellam Onre? Since you replied, my next question was WHAT / WHO is unfortunate. Frankly, I do not get the point about "unfortunate". I will attempt to post snippets from the conversation. If you wanted an answer from David,you should have addressed him,which you have not. Now that you have addressed me,you may again refer to my Posts,which I have volunteered as I know the Background. If you were to ask me who is 'Unfortunate',I would say it is neither Sundaram,nor the Seekers who will benefit by reading this book;I would say it is the Ashram Management who deserve to be called so,as they are losing this opportunity to be of service in the dissemination of the teachings of one of the Great devotees of Bhagavan.This is nothing new;I understand that even works of other devotees were given a raw deal,when Sri Bhagavan was alive. Trust you are now clear about the 'Why' and 'Who' of Unfortunate. "This is nothing new;I understand that even works of other devotees were given a raw deal,when Sri Bhagavan was alive. ".......Did Bhagavan object? Maybe you know that background as well. Dear Ravi: Thanks for all the info on Sri Annamalai Swami conversation. Could you please tell me the quickest way to obtain this recording in Thamizh? I live near Los Angeles, California. Please let me know if it is available over the web for download or if you can send a soft version of it (which, of course, I will pay for) - thanks much in advance. This is great. Understand from Sri sundaram that an investment of Rs 40000 has been made towards the publication of the Telugu copies and is yet to be paid.Looks like someone came forward to typeset it for DTP.It was subsequently printed at another press,Aridra Printers Bangalore;the propritor is a devotee of Annamalai Swami and has told sundaram that he may pay him after the copies are sold! Those interested may volunteer to donate towards this Good cause.You may contact sri Sundaram through the ID provided by David. that these copies are sold at Sri Ramanasramam (price definitely chepaer than International price), they have been taken up for sale at the Asramam. Another example is Sadhu Om's books (except the old copies commited by the Asramam) and Michael James translations are sold only in Manakkula Vinaykar house of Sri Sadhu Om and not in the Asramam. The English editions of Living by the Words of Bhagavan and Final Talks are no longer being sold by the Ramanasramam Book Depot. Visitors to Sri Ramanasramam can buy them from Bhagavan Arts, the bookstore located opposite the Ramanasramam gates. I can post copies of these books to devotees in India if a postal MO is sent to me in advance. My contact address is in the sidebar of this blog. It is high time you bring out "kindle" versions of your books and sell it through amazon.com . I would like electronic versions of all of David's books as well. Ebooks are on the way, but it will take some time. Someone volunteered to so it for me earlier this year, but she left India and it doesn't look like she will have time to take on all the work. I think I will now have to do all the work myself, which means fitting it in between a lot of other pending projects. I really want to read your three volume biography of Poonjaji. However, when I last checked with the bookshop opposite the Ashram, they said the price would be around Rs. 2400/-. They explained that the reason for the high price was due to the fact that it is an American edition and the book is imported from America. Would it be possible for you to speak to your American publishers and arrange for a more affordable Indian edition ? I am sure there are many people like me who would like to read the book but cannot afford the current price. Email me at david_godman@yahoo.co.uk and I can help you to make a donation to the devotees who are looking after Annamalai Swami's affairs nowadays. "Ebooks are on the way, but it will take some time. Someone volunteered to so it for me earlier this year, but she left India and it doesn't look like she will have time to take on all the work. I think I will now have to do all the work myself, which means fitting it in between a lot of other pending projects." Is there anything we could do to help you with this? Is this something that you could potentially pay someone to do if you received funding from the community to do so? If have have any interest in making this happen, you can email me. Can someone tell me how to get hold of Sadhu Om's books (original tamil version)? Sri satguru annamalai swamigal spiritual trust has brought out a video footage in 2 DVDs of Annamalai swami narrating his life story and his coming to Sri Bhagavan and life at Sri Ramanasramam(period 1928-1942).This is a wonderful account and a rare document of inestimable value-The audio quality is poor but yet serviceable;Swami's voice has to be picked amidst the noise of Heavy vehicles and their horns on the roadside.The built in mike of the camcorders are often placed to facilitate the videographer to add his commentary rather than capture the voice of the one who is videographed!One finds Swami sitting on the familiar cot in his room where he used to receive visitors in those days.Sri Sundaram sets up a audio recorder near swami and prompts him -'now you can speak'.Swami Begins :'I will tell the story of my life'.He begins -'My mother is aNNam,good natured and a pathivrata;My father is chinniah'.Swami says that Chinniah was respected by the villagers and used to be called 'jnAni'.He used to do Surya Namaskar daily.Swami acknowledges that his father was his first teacher-it was he who taught the swami when he was a boy,to get up before sunrise and do 12 Soorya Namaskar.Swami goes on to add what is already found in David Godman's wonderful book-'Living by the words of Bhagavan'. These video were taken in 1993 by a couple of Japanese sisters -'meera Sisters' .There is an acknowledgement in the opening of the video thanking David Godman and the 'Meera sisters'. Those who understand Tamizh will find it absorbing to hear the life of Annamalai swami narrating it all in a matter of fact way,staitlaced.Those who knew and have seen Swami would know that Swami was much more animated and freer than this in his conversations and interactions. There is no price tag attached to these DVDs.Those interested may contact Sri Sundaram through email. It will be a good thing to remember that the resources of the Spiritual Trust are quite slender and it does not have any regular office to handle packaging and forwarding.Sri Sundaram has to walk to the Post Office or to the courier to despatch the goods. R u good in Dance? - Bharatanatyam, western, folk, contemporary? R u good in Music? - karnatic classical, devotional, instrumental music? This competiton is for you!!! Any Talent!! Any Age!! Right from your Home!!! Dowload a song and interpret it your way, in your interest area! upload it and send it! Wisdom must prevail upon the Continuity principle. Many inter-twined threads can be integarated through Cosmology digest.